Work from Home Jobs for Nurses – 17 Companies that Hire Remotely: If you’re a Registered Nurse, LPN, or PRN — or know one who’d like to work from home — this list is for you. Side Gig – P/T Delivery Drivers Needed – Waitr: If you’re looking for a side delivery gig like Uber Eats, and you’ve got a reliable ride, Waitr needs people to deliver restaurant orders. “Make an average of $12-$15 an hour,” the company says, though this will probably vary by location, time of day, clustering deliveries, etc. (Don’t forget gas and car expenses.) Active in metro areas in AL, AR, FL, GA, LA, MS, NC, SC, TN, TX. Pays weekly by direct deposit. “We Got Hired!” — Congratulations to some of the newest RRR job finders! “Thank you RRR! I started training today at Support.com as a remote service technician,” Angela Rose posted to our FB page. “I GOT HIRED!!!! Thank you RRR. I got hired with Unum.com and actually enjoy a job for the first time in a long time,” Trina B. emailed us. “I got hired with Hilton as a [email protected] reservations specialist. You guys posted to apply immediately and I did! Got hired yesterday! Thank you for posting these resources <3,” Keynikka emailed us. “I got hired at Support.com! Thanks for the info Rat Race Rebellion!” Keisha Martin posted to our FB page. Well done, everyone! 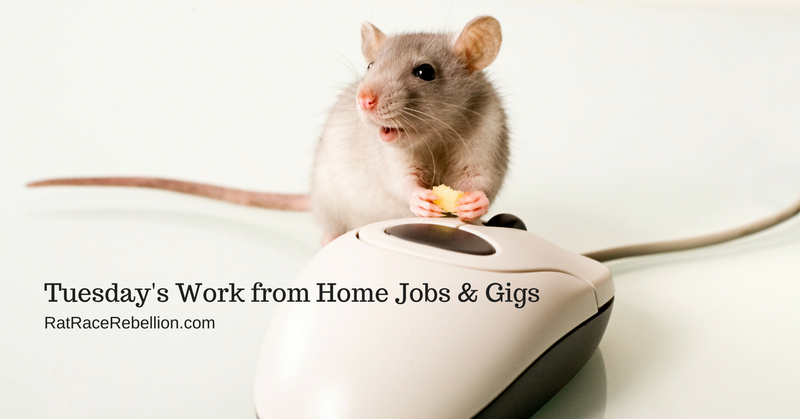 We hope you love your new work from home jobs! 10 Online Side Gigs You Can Do Now – If you’re looking for side cash, here are 10 screened options to choose from. Work from Home Volunteer Jobs – The Humane League: Here are some more legitimate [email protected] volunteer gigs. Virtual volunteering — especially as a side gig — can update your resume and add the critical [email protected] experience that employers are increasingly looking for. You may also be hired by the volunteer organization you’re working for. Get Paid for Ads on Your Car – Carvertise: Most car ad offers are scams. Here’s one of the few legitimate companies. Calling All Teachers – Earn Up to $22/Hr. Teaching English Online – If you’re looking for a side gig with good hourly rates, these companies are actively hiring. Both involve teaching English to Chinese children online. Set your own hours, materials provided: Education First — $12-$19/hr. VIPKID — $14-$22/hr. For an advantage, schedule your video interview (and nail it) promptly after you apply. The video interview with each company is key.